Join me for a luminous yoga experience and embark on a deeply transformational journey. Expand your understanding of yoga and explore your teaching possibilities in this immersive yoga teacher training program in Sumbawa, Indonesia at Whales and Waves Resort. Learn to navigate through some of your favourite and foundational postures while gaining a deeper understanding of the traditions of Yoga. With a focus on energetic alignment, strong physical foundations and integrity in movement, this course delivers something unique and personal to everyone. This teacher training will gift you the tools to continue to evolve as a student or teacher and inspire you to radiate health through a strong physical and philosophical yoga practice. This unique training is designed to explore the alignment and benefits of Hatha Yoga as well as the practical aspects of teaching asana, pranayama and meditation. We dive into philosophy, sanskrit and the traditions of yoga while exploring the current evolution of movement cultures. This is an opportunity to explore the understanding of your practice in a way you have never experienced before and promises to be a thorough examination of the self, firstly through strong foundational Hatha yoga alignment and developing to the understanding of vinyasa movement. Welcoming transformation while exploring the synergy of breath and movement in a full range of postures such as hip openers, twists forward folds, balances, backbends and inversions! Students from all yogic backgrounds are welcome to apply. This is a 200 Hour Yoga Alliance accredited Teacher Training Program and as a residential program, students will be required to attend the entire training to complete it. This intensive teacher training allows us to focus on intelligent alignment while connecting asana through the 5 Prana Vayus. We predominately work with static poses first, then in this foundational understanding begin to awaken the vinyasa experience. Each day in paradise begins with meditation, pranayama and an Illuminating yoga practice. These strong practices are based on Hatha Yoga postures with precise alignment leading to basic vinyasa class styles. Daily Practice of Asana, pranayama and meditation. You will understand the alignment of yoga poses with integrity of form while also exploring the benefits of asana. We will also learn the traditional sanskrit meaning and pronunciation of each pose. Be a student of yoga first and foremost and then a teacher. Illuminate your own practice and learn correct techniques to share with your students. 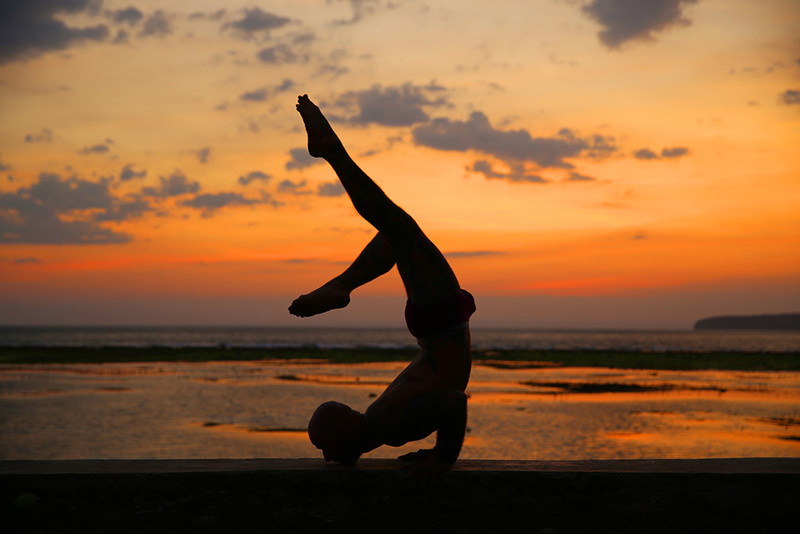 Each day through the practice you will find your way into all variations of asana: Inversions, Arm balances, back bends, twists, balancing poses and the standing series. Building the foundations of a strong physical practice with integrity of form and movement to eliminate the risk of injury. The sequences given to you are perfect to take with you to create a sustainable home practice. We dive into basic anatomy and anatomical alignment in order to understand the body and its systems. Every day we go over the morning’s practice and understand why we sequence the way we do. You will learn how to teach the founding principles of the Illuminating Yoga practice into your own teaching for public, private, or workshop settings. Teaching can be a daunting experience. But with this course, there will be ample opportunity to teach in both small and large groups to develop your teaching skills. Mentorship and feedback will be provided to help you find your unique voice as a teacher and build your confidence to step out into the world of teaching. Drishti teaches control of wandering eyes and wandering energy by limiting your intake of external stimuli to help manage your mind instead of allowing it to manage you. Kriyas are cleansing techniques used to purify the body and mind, which open the pathways of the body. Mudras are higher-level practices that arouse prana, chakra and kundilini power and communicate between the known and unknown. Our practice takes us into these areas of focus. Hands-on adjustments are one way we can communicate with students and guide them towards a greater sense of body awareness. To understand how a posture feels in your own body with an intelligent and caring hands on assist can take your practice to new levels of awareness. Broaden your yoga studies as we delve into the history of Yoga, the philosophy of Yoga, the Yoga sutras, the 8 limbs of Yoga, pranayama, sanskrit, koshas, kriya and the vayus in our physical practice and study. This is a deepening of your illuminated practice with a broad spectrum of knowledge to draw upon for your teachings. Life begins and ends with a breath. Without your breath there is no life, so first and foremost it is our priority, but it is often forgotten. Deep awareness is brought back to breath control through various pranayama techniques. Pranayama is one of the most important practices of all forms of Yoga. It enables the Yogi to obtain control over the nervous system and it is this control that gradually fuses the connection of prana and mind. For the movement and release of prana we use pranayama to stimulate the energy in the body and help bring lightness and vitality in the practice. Mantra and meditation helps clear the mind of misconceptions. Mantra works like a tuning fork, using sound to create a physical sensation that vibrates in your body and mind. The practice of mantra meditation will ultimately quiet the thoughts that dominate your mind, so you are able to experience your full potential and realise your true nature.These practices are part of our focus & guidance prior to teaching others. The chakras are a part of what might be called our spiritual anatomy. Just as there is an anatomy to the physical body and maps to the physical world, so also there is a definite anatomy of our spiritual being, as well as maps and guideposts to follow along the path of inner awakening. Ayurveda is a sister philosophy to yoga. It is the science of life or longevity and it teaches about the power and the cycles of nature, as well as the elements. Practical tools for the business of yoga and transitioning into a teacher. Discussing the experience of teaching workshops, teacher trainings, studio classes promotions, online presence and the internet and all things in between! You will have many opportunities to sit down with Arian and his assistants in this beautiful island location to discuss your practice, teaching, and any concerns you have about life, love and the universe.